> Bocca East opened about 3 weeks ago in my neighborhood, finally replacing a restaurant that closed after a fire last year. On a block with a few other excellent Italian places, I was surprised that every time I walked past it’s been totally packed. Huge windows allowed a peak into the restaurant, which is rustic, cozy, warm and welcoming with brick walls, tons of displayed wine bottles, fire places and artsy chandeliers. The bar goes the entire length of the restaurant and looks very conducive to eating and drinking alone. Towards the back, the windows continue and you can look in on the kitchen which I really like…Nothing to hide. A friend and I met for dinner tonight. We made reservations for 7:30 and were seated immediately. Water and bread were brought out right away as we browsed the menu- which was very similar to Uva, one of my local favorites just a few doors over. The wine list is extensive, 3 times the size of the food menu, so I decided to have a taste size glass of Pinot Grigio. I LOVE when restaurants offer this petite size, perfect for someone like me that has a low tolerance but loves the taste. 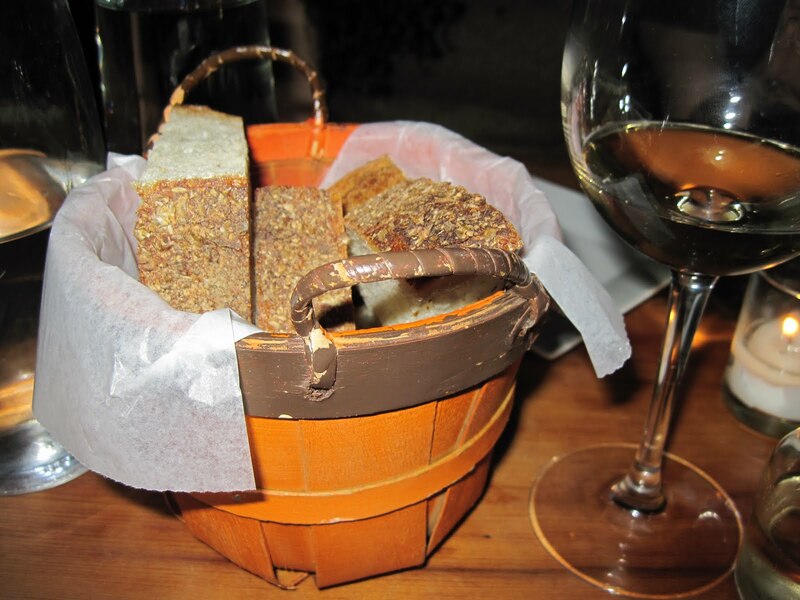 The bread was fresh and had a great consistency, but I felt the olive oil for dipping was not the best quality. I ordered the artichokes starter which came with a delicious basil aioli dipping sauce and I was very impressed with it. The artichokes were quartered and pan fried. They were not coated in any kind of breading or batter so you could really just taste the vegetable without grease or crust in the way. 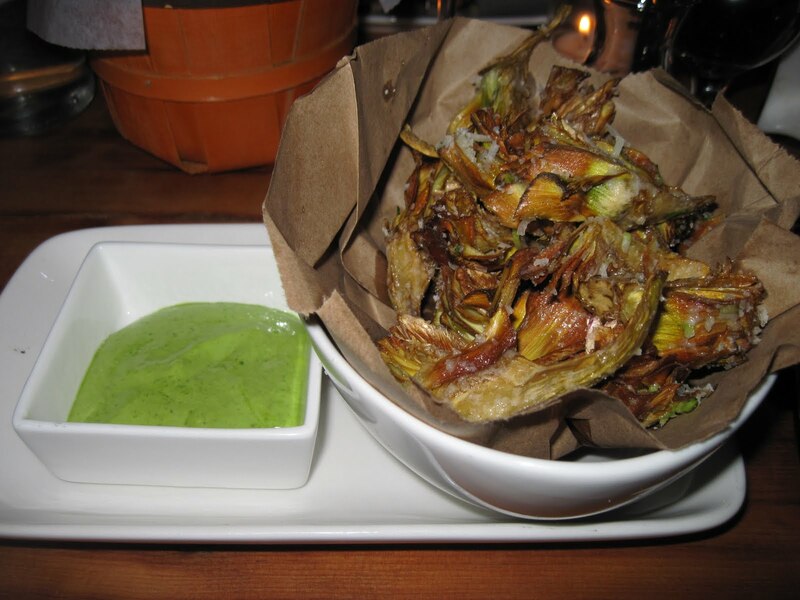 Fantastic appetizer for an artichoke lover like myself. 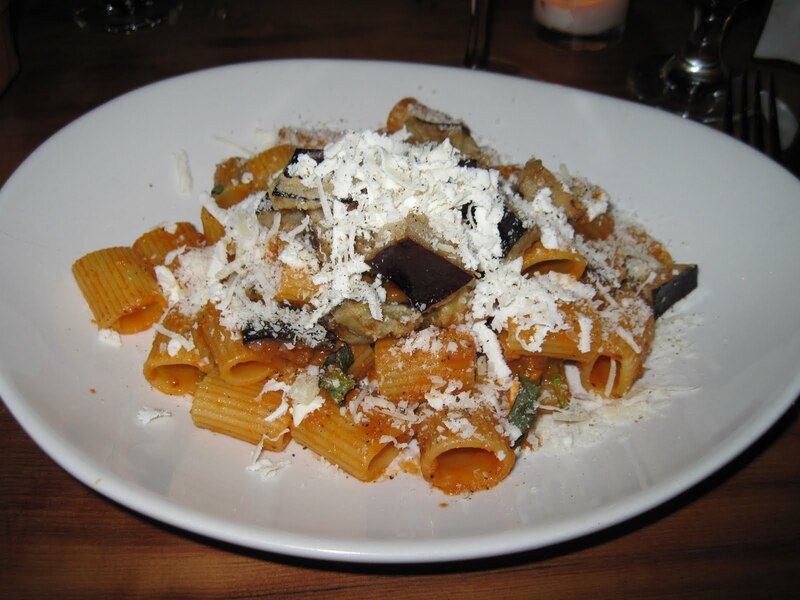 For my entree I had the Rigatoni with eggplant and ricotta and I absolutely loved it. The pasta was obviously homemade and cooked perfectly al dente. The light tomato sauce and eggplant were hearty without being heavy, and the cubes of ricotta added a rich, creamy touch. I had ordered a half size portion (another size option that I love) and cleaned my plate. The only negative here was the service. Our waitress was clearly rushed in telling us the specials and did not check in us much at all. They have a staff of busboys who pretty much take over after orders are placed and we literally sat and chatted for half an hour after we were offered dessert and declined. When we finally saw our waitress, who had pretty much vanished, we asked for the check. Now, don’t get me wrong. I DO like to be able to chat without feeling like we are being rushed out the door, but I also feel that in periodic check-ins are the wait staff’s responsibility and that was clearly not part of her repertoire. I think they are a bit understaffed since they are so new, and they will probably work out these kinks as they go forward. Overall this is very comparable to it’s neighbor Uva, with a similar vibe and similar menu, but here they take reservations, a total plus. Being that it’s a 2 block walk from my house, I’m quite sure I’ll be returning. Glad to welcome it to the neighborhood!